It’s no secret that I’m a honey garlic fan. I almost feel like I can make honey garlic sauce and dip everything into it. 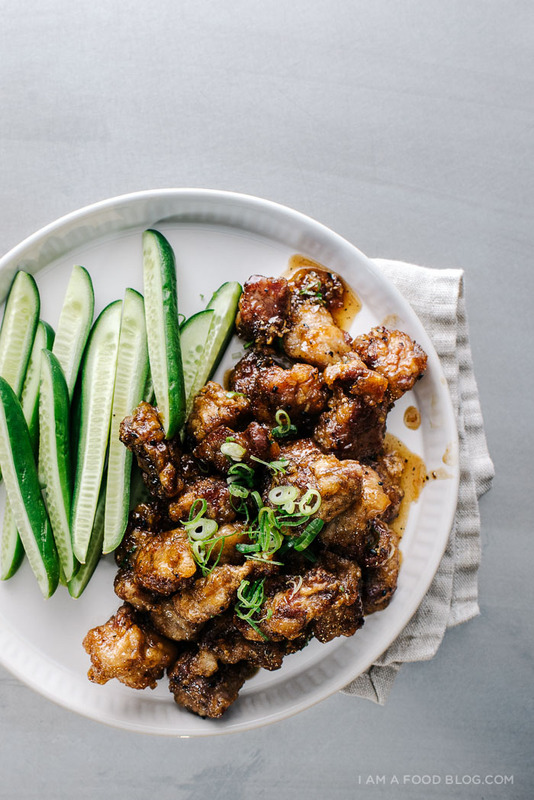 My favorite growing up was honey garlic pork. Even though I was the pickiest kid on the block, I couldn’t resist the sweet and savory combo of honey and meat. Honey garlic is definitely a nostalgic thing for me but I still love it now and I’m pretty sure I’ll love it forever. 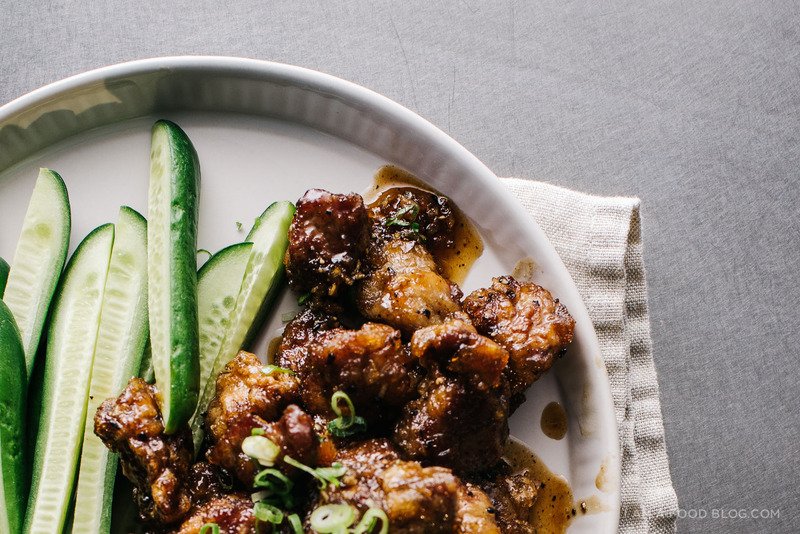 There are so many ways of making honey garlic [insert protein of choice]. The technique I used here is called Chinese velveting. 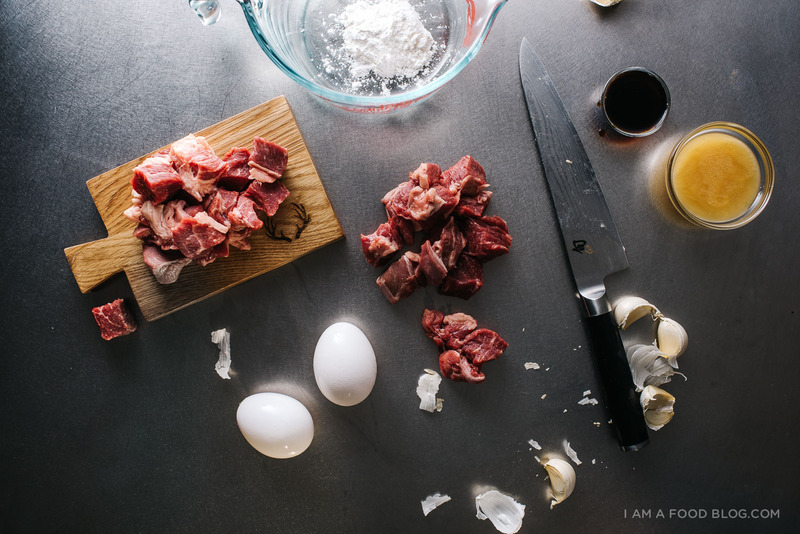 It’s a bit of a funny name, but essentially what you’re doing is making the meat tender and velvety by coating it in egg whites and cornstarch. When I was a kid, my mom would always let me use my hands to velvet the meat before cooking – I thought it was absurdly fun and she probably liked it because it kept me still for a minute or two. It’s an extra step that’s done with most stir fries and before deep-frying. Some people skip out on it, but the cornstarch and egg whites makes things crispy. It sort of creates a seal so the meat inside juicy, tender, and, well, velvety. This was a super simple meal to whip up. Yes, you do have to deep fry the steak bites, but I find that every once in a while I get a deep-fry craving that I just need to satisfy. 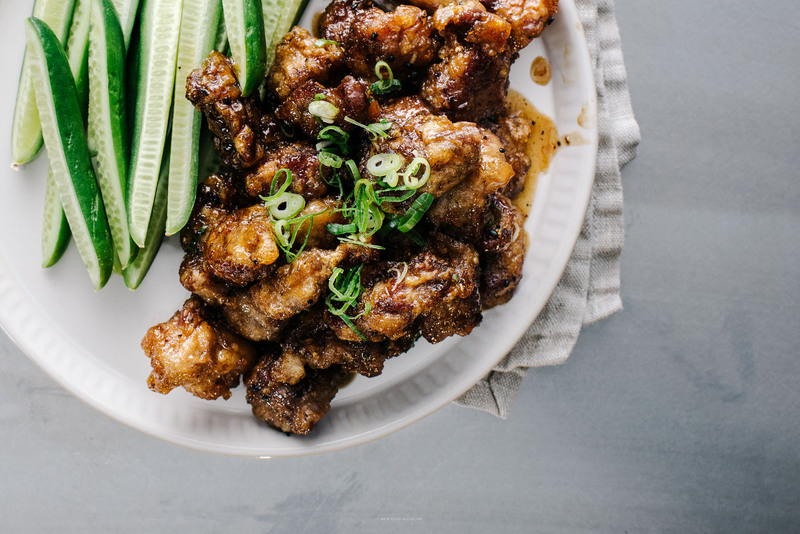 I served the honey garlic beef with some cucumber spears and rice and it made for a satisfying hearty meal. Totally hit the spot! PS – I’m in Minneapolis right now and it snowed and I’m so happy! I’m here for a cold minute and if you want to follow along, check out my snapchat (iamafoodblog) for updates. In a large bowl, whisk to together the egg whites and cornstarch until light and frothy. Add the steak pieces, coat and let sit while you heat up your oil. Place a cooling rack over a rimmed baking sheet lined with paper towels. Heat an inch of oil in a high-sided, heavy bottomed pot or skillet over medium high heat until oil reaches 350°F. 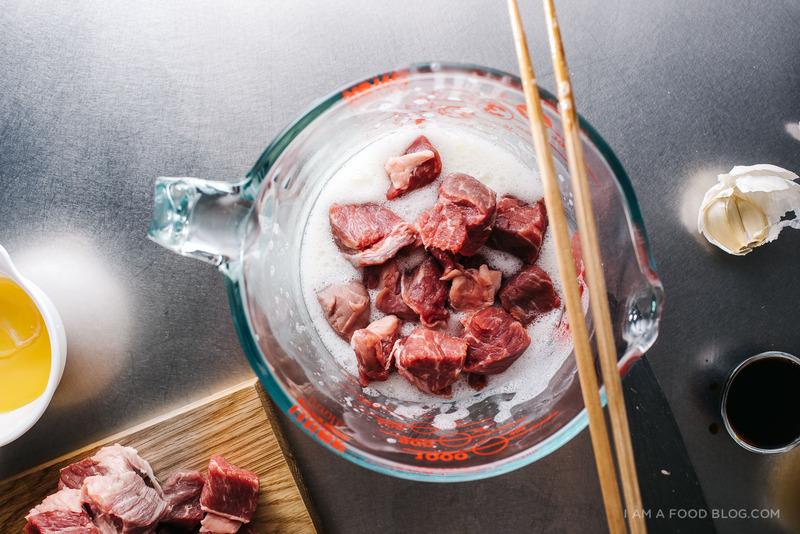 Use a pair of chopsticks or tongs to carefully drop the steak pieces into the hot oil, being careful not to crowd the pan. Cook until golden brown and crispy, about 5-6 minutes, flipping if needed. Drain the steak bites on your prepared rack and keep warm in the oven. In a non-stick pan, heat up a touch of oil and cook the garlic on medium heat until slightly golden, but not browned, 1-2 minutes. Add the honey, soy sauce and ground pepper. Turn the heat up to high so the honey-soy mixture bubbles, thickens and turns into caramel-sticky goodness. Toss the steak bites with the sauce and garnish with sesame seeds and green onions, if using. Enjoy immediately with rice or grain of choice. Note: I used chuck, but feel free to use a tender cut of meat. The beef doesn’t cook for too long, so sirloin or rump would be good choices. Hmmm I love anything that has been velveted! The slight crispiness but at the same time the meat is soft and saucy, YUM! Have to try this recipe. I totally get “deep fry” cravings too! I deep fried my Christmas turkey in 2015 so a few steak bites seems totally do-able! So trying this recipe. I love that the technique is called velveting!!! so accurate and descriptive! Mmm I love honey garlic. I’ve never tried this technique before but anything that’s going to get my deep fried meat extra crispy sounds great to me! I’ve never tried velveting before. Well, I know what I’m doing tomorrow! This recipe looks delicious! Have fun in minneapolis! Chinese velveting – that’s a new term but so tactile and imagery-provoking, and I love it!!! This looks delicious! I’m totally putting it on the “to-make” list soon! Crispy fried meat coated in salty-sweet sauce things are my weakness! PS – your photography is consistently awesome, keep it up! Thx u so much for this amazing recipe, garlic and honey are always a good mix. What’s the cornstarch to egg white ratio? And the honey to soy sauce ratio? Yum! Your lemongrass pork meatball/ quinoa bowl has been a go-to of mine for a while now…looking forward to trying out the honey garlic beef. Thanks for sharing! I’m intrigued, where did you get your collection of very unusual cast Iron pans? I’ve never seen an Octagonal cast iron pan before! The staub oval cast iron pan is pretty unusual as well, can’t help but wonder if you are a ‘collector?” I have one 9″ square cast iron pan I found at a second hand store that I use for making cornbread. Anyway, thanks for sharing both recipes and all the others you have posted! This was linked on MSN news feed and I am so happy they added your recipe to easy weeknight dinners collection! I now know what I am making for dinner. I have never tried “velveting” before. I always dipped my chicken and pork in a tempura batter. I like this method so much better. Seems much cleaner, less heavy and it tenderizes the meat! Win, Win, and Win! Thank you so much for sharing this technique and recipe. I am now a subscriber! As usual, thanks again for sharing another great recipe! 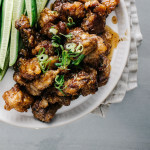 My next goal is to try this with chicken and try to recreate a Honey Sesame Chicken recipe that a local teriyaki restaurant makes, but they changed chefs or something any it always came overdone after awhile! In all fairness to the Asian restaurants, yes they do use “inferior cuts of meat,” however, with the tremendous overhead they have, the competition and etc. it’s no wonder! I’m officially and old geezer and have seen far to many great Asian and other restaurants go the way of the American Passenger Pigeons as in extinct! 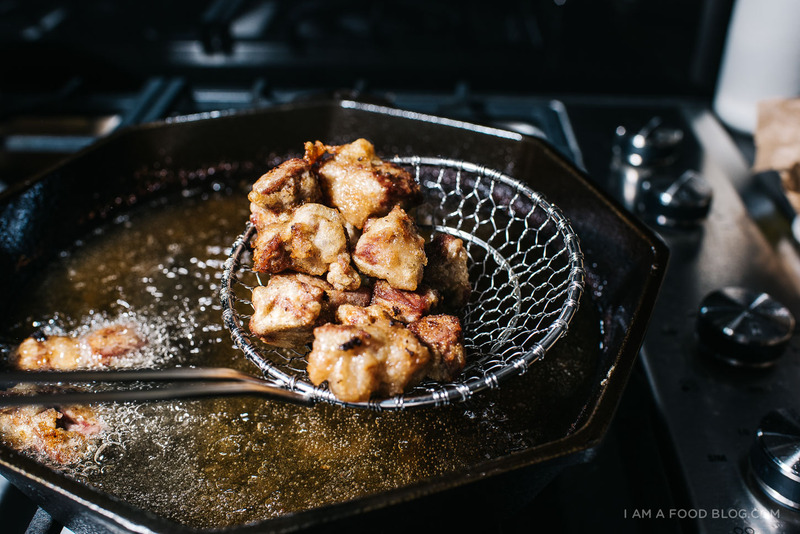 Picnic Popcorn Chicken Karaage + Actifry Giveaway!